Over years of relentless innovation since 1991, IDEO has been responsible for many famous products, including Apple's first mouse and Steelcase's Leap chair. The design and innovation consulting firm is known for its 'design thinking' methodology: identifying new ways to serve and support people by uncovering latent needs, behaviours and desires; developing new companies and brands; and designing the products, services, spaces and interactive experiences that bring them to life. Having a global presence of more than 600 staff, with offices in 10 countries, the firm's success is built on specific driving principles that include eternal learning and putting human experience at the heart of everything. 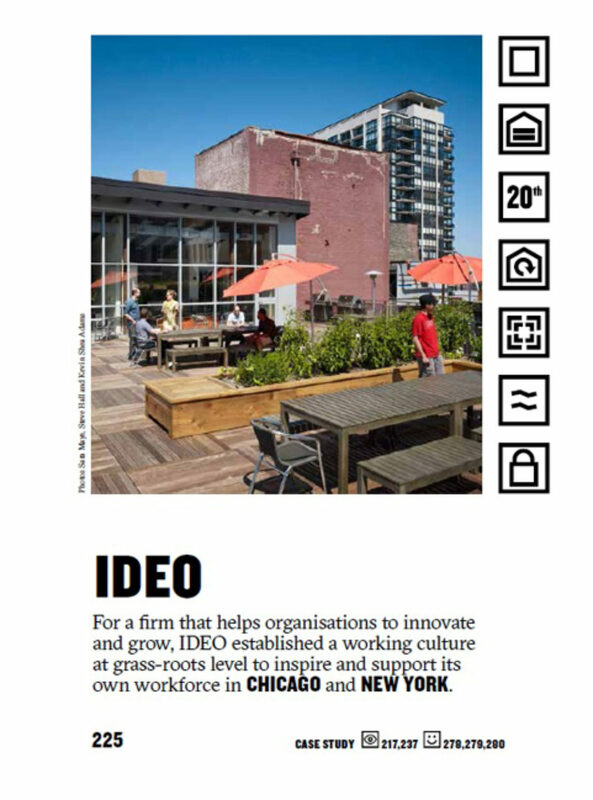 Visits to two of its offices – in Chicago and New York – reveal how this organisation applies its design thinking approach to itself. 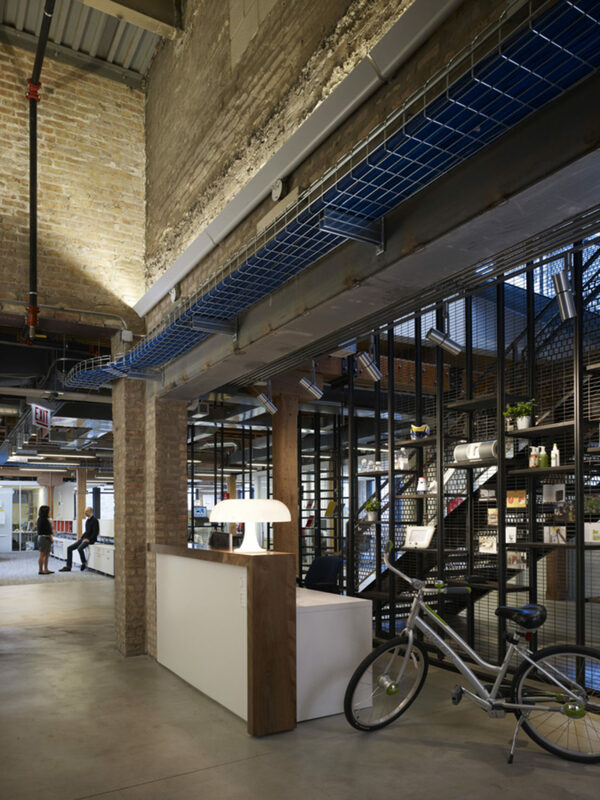 By continually learning about how the design of its own spaces impacts its people and processes, the firm regularly adjusts its office design to support what works in encouraging creative productivity. Each decision made in the conception, design and creation of IDEO's spaces reflects the firm's own design process at work. Team project rooms surround an open studio, which supports the interdisciplinary work of designers, business strategists and programmers. When teams are assigned to certain projects, they move into a space and stay there for its entire duration. While there are some meeting rooms, the vast majority of a team's work is accomplished in the project space itself – which teams must then adapt to support individual working styles and meld to the topic in question. It hasn't always been this way: the Chicago team's previous office was completely open plan but that didn't really work. So the workspace was divided into different cubicles using large foam boards. Andrew Burroughs, partner and project lead in Chicago, recalls: "You could hear every conversation up and down the room; it was really noisy. We learned that we needed space for our teams that allowed them to focus and concentrate." 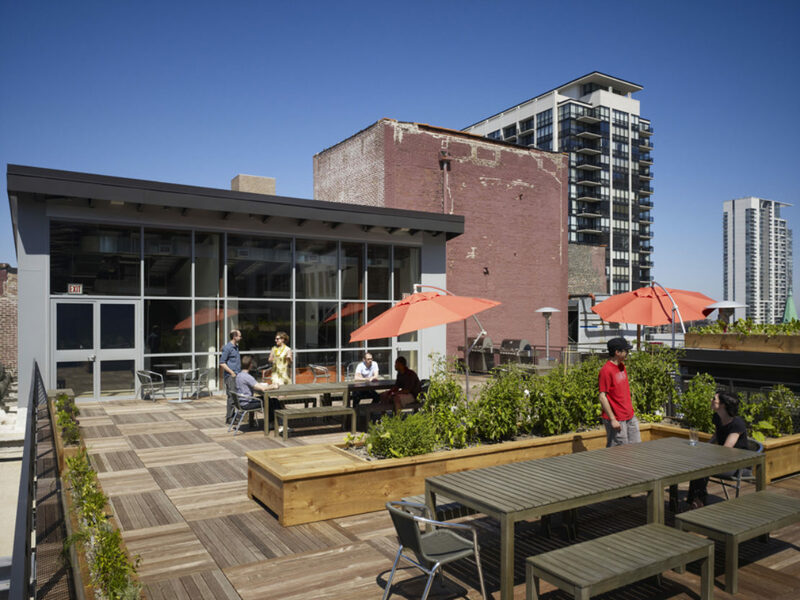 When the time came to move to a new location in the city, it provided an opportunity to rethink, prioritising team areas over individual space. "The most important thing is we have really nice places for teams to work," says Burroughs, "with their own lighting, their own thermostat; they can open doors to feel connected to other teams or close the doors if they need quiet to concentrate." Over time, the company has found that giving each team one thing to focus on for a few months results in a higher level of performance and output. When a project finishes, the team disperses back into the pool of available talent, the next project comes along and a new team forms with different people. 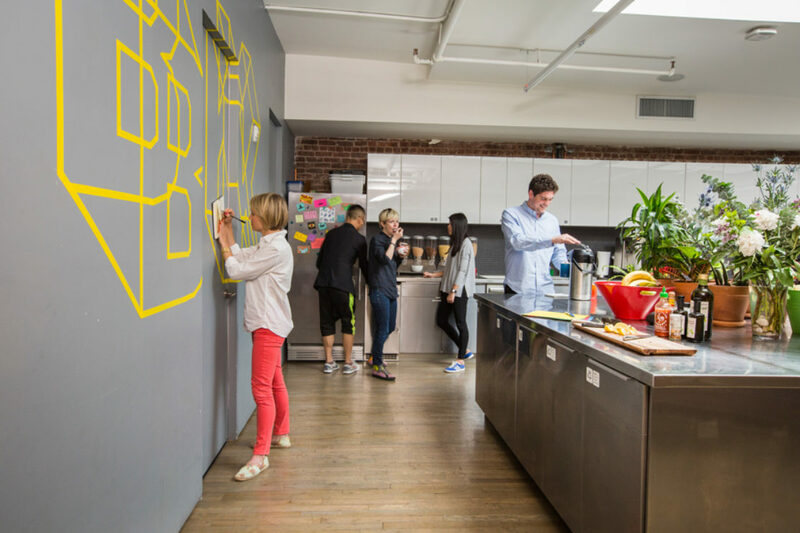 This intermingling means employees frequently work with different people and in different styles of collaboration – which is where IDEO believes some of the company's creativity comes from. As Burroughs says, "The diversity of backgrounds, skills and experiences means that someone could bring an idea from a previous project into the next project, or a perspective from a completely different industry which might set the team off in a direction that they may not necessarily have gone down." Between projects, employees find a place in the open studio to get comfortable, but not too comfortable. Here there are no corner offices, no preferred locations: "You can't get too bedded down because you're going to get moved pretty quickly for your next assignment," says Burroughs. There's a conscious shift of mode and tone between the functional, head-down, focused work in the project areas and the more social aspects in-between. The locations of these spaces relative to the project areas are important, as Roshi Givechi, head of the New York office, points out: "We've created a type of spillover landing zone directly outside project spaces using different furniture, where larger tables support creative interactions in a clear space, without all the clutter from the project space itself." 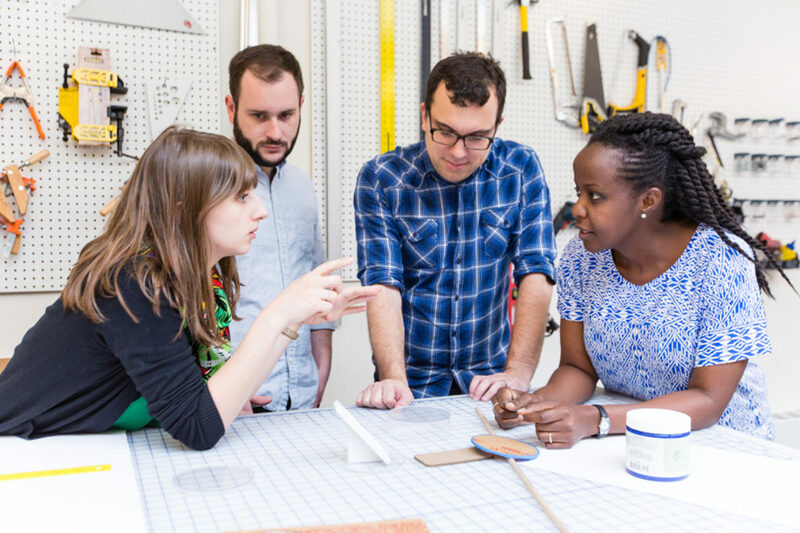 Team members value simplicity and low-tech tools to help them get ideas out quickly, and there's no room for complex procedures or preciousness around how tools and spaces are used. "Despite all the digital tools that are out there, we still use Sharpies and Post-it notes and stick them on foam boards," says Burroughs. "It's a very lo-fi way to communicate. We're not a presentation culture – we set the bar low for generating ideas." Putting ideas, thoughts, stimuli, information and insights up on walls for people to see is a critical part of the creative process. "If you take all your thinking and archive it on a drive somewhere in the cloud, no one can see that, no one can reference it, no one can go back and pull up a Post-it note that has a really good idea [on it] and bring it to the forefront," says Burroughs. The visibility and accessibility of working thoughts enables collaborative conversations to happen, whether passing by or in a more deliberate creative session. The IDEO working process prizes bringing ideas to life quickly and making them tangible in order to communicate, test and build. This attitude has been consciously applied to the company's working environments, too: "We don't want something that has been designed so that it just looks great on day one and it continues to look that way for the next 20 years," says Burroughs. "We need something that is going to change with us, because our business is changing all the time. The kinds of products we're doing are constantly evolving and we're continually working with new and different types of organisations. I couldn't tell you next year what our list of clients is going to be compared to this year, let alone 10 years out, so how can we possibly predict what our space needs are going to be?" 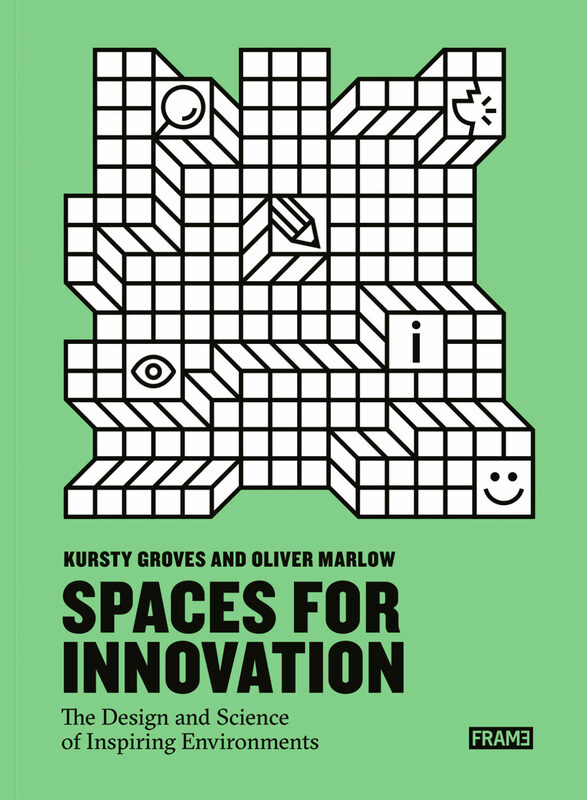 It's not just the space that is considered ripe for tinkering with; working styles, behavioural norms and rituals are also on the drawing board. "We have to design the rules and agree how we want to use the space," says Lawrence Abrahamson, design director in New York. "There's always some type of agreement necessary. Some of those are just a prototype. Letting space change, seeing how people use it and enabling it to easily change means that people can try different things. There's a feedback loop of observing and understanding then responding and sometimes provoking." Abrahamson believes that the conversation around space often begins in the wrong place, starting with the physical object, furniture or room rather than the human experience: "How often do we ask what we want our spaces to do and not just what we want them to be? The emphasis should be thinking about the activities and experiences that we want to create and then how we actually enable that."